Family Medicine Center provides American Heart Association CPR and First Aid courses. We offer classes for individuals with no previous training, for businesses and groups, and for parents and caregivers. If you would like to schedule a class please contact Rhonda Higgs 702-9310. Heartsaver® CPR AED is a classroom, video-based, instructor-led course that teaches adult CPR and AED use, as well as how to relieve choking on an adult. This course teaches skills with AHA’s research-proven Practice-While-Watching (PWW) technique, which allows instructors to observe the students, provide feedback and guide the students’ learning of skills. Upon completion of this course, students receive an American Heart Association Heartsaver CPR AED Course Completion Card that is valid for two years. 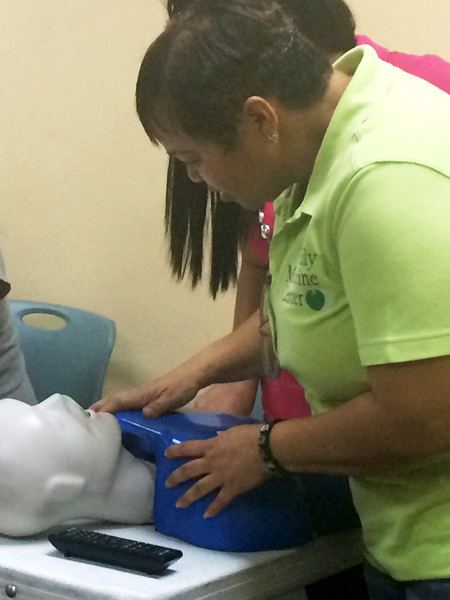 During the course, an AHA Instructor conducts video-based lessons and works with students to complete their CPR and AED skills practice and testing. We can provide on-site training for companies, corporations and civic groups. Contact Rhonda Higgs to arrange a class at your location: 702-9310.